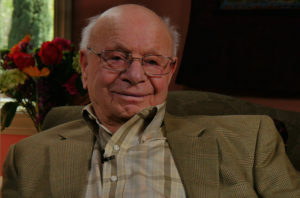 (JTA) — Herman Shine, who is believed to be one of the last survivors to have escaped Auschwitz, has died. Shine, who worked as a roofer at the Nazi death camp before making a daring escape with his good friend Max Drimmer, died on June 23. He was 95. Shine, born Mendel Scheingesicht in Berlin, was arrested in that German city in 1939 and then deported with 1,700 other Polish Jews to the Sachsenhausen concentration camp. Shine’s father was Polish. While working at an Auschwitz satellite forced labor camp in the town of Gleiwitz, he met a Jewish girl who worked in the camp and was able to return to her home at night. The girl, Marianne, would later become his wife. A documentary about the men, “Escape from Auschwitz: Portrait of a Friendship,” was released in 2001. It was updated and re-released in 2015 with additional material.